Today is the summer solstice, so I figured I would take a break from my (slowly) ongoing series of posts on the Pueblo I period in the northern Southwest to take a look at evidence for ancient astronomical knowledge in a different part of the Southwest. This is in part an outgrowth of my recent thoughts on the role of astronomy in the rise of Chaco Canyon to regional prominence, which in turn was spurred in part by the realization that Chaco appears to show the earliest evidence for complex astronomical knowledge in the northern Southwest. The idea, which I explored exactly one year ago in this post, is that by the eleventh century AD the Chacoans developed a knowledge of astronomy that they were able to use as esoteric ritual knowledge to enhance the canyon’s role as a political and economic power throughout the region. This idea led me to wonder, however, about the history of astronomical knowledge in the southern Southwest, which was culturally quite different from the northern areas influence by Chaco. In particular, the Hohokam of the southern Arizona deserts show both a longer history of intensive agriculture and a closer connection to Mesoamerican societies further south, both attributes that could be relevant to their knowledge and use of astronomy. If evidence for that knowledge among the Hohokam long predates that evidence at Chaco, this leads to interesting questions about the origins of Chacoan astronomy. If it doesn’t, that leads to other interesting questions about both societies. Luckily, the same special issue of the journal Archaeoastronomy that contains an article on Chacoan astronomy that I discussed in a previous post also contains one on Hohokam astronomy. This article, written by Todd Bostwick, discusses evidence for astronomical alignments in Hohokam monumental architecture and rock art, as well as the astronomical and calendrical practices of the modern O’odham people who inhabit the same area (and whose relationship to the Hohokam is unclear and controversial, although Bostwick doesn’t discuss this). 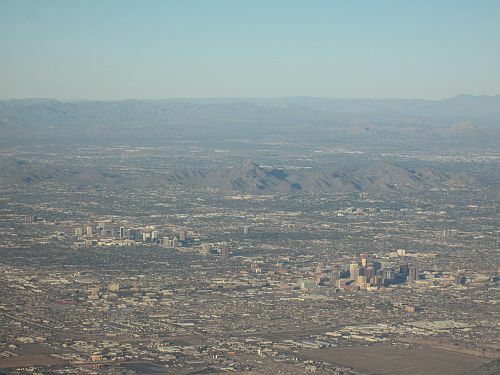 Bostwick’s focus is on the Phoenix area, which is considered the Hohokam heartland. Bostwick documents a wide range of possible alignments in Hohokam architecture and petroglyphs, primarily solstice-oriented. These include a large number of rock-art sites in and around the mountains that show clear alignments to the solstice sunrises, particularly associated with a distinctive dot-in-circle motif that may be a sun symbol. There are also some rock art sites with complex patterns of light and shadow interacting with the petroglyphs on the solstices, similar to the famous “Sun Dagger” petroglyph on Fajada Butte at Chaco. In architecture, perhaps the most intriguing alignments are a series of holes in the upper walls of the “Big House” at Casa Grande Ruins National Monument which show possible alignments primarily to the equinox sunrise, and perhaps to some of the lunar standstill moonsets as well. There are also astronomical alignments associated with platform mounds at the villages of Mesa Grande and Pueblo Grande. The rock art alignments are notoriously difficult to date, of course, and the aforementioned architectural features all date to relatively late in the Hohokam sequence and are therefore not very useful to understanding the origins of Hohokam astronomical knowledge. There are, however, features at the earlier village of Snaketown that may have had an astronomical purpose, although it is less straightforward than the others. Snaketown was the preeminent village of the Hohokam during the Sedentary period, which is roughly contemporaneous with the florescence of Chaco (ca. AD 900 to 1150), although its history extends back several hundred years earlier. It was not occupied into the following Classic Period, when the other villages mentioned above reached their peaks. There is an alignment between the central plaza of Snaketown and Gila Butte, a geological formation to the southeast that is considered sacred by the O’odham. On the winter solstice, the sun rises between the two peaks of the butte when viewed from the plaza, and Bostwick suggests that the siting of Snaketown may be related to this alignment. If so, this would imply knowledge at least of solstice alignments was much earlier in the Hohokam area than further north, but without clear evidence from earlier periods this must remain speculative. Another intriguing but ambiguous feature at Snaketown is the platform mound known as Mound 16, at the northeast edge of the plaza. This circular mound is surrounded by a series of 52 postholes, placed fairly regularly but with gaps on the northeastern, southern, and southwestern sides of the mound. There are no structures or postholes on top of the mound, but there is one hearth at the southern end associated with one of the gaps in the ring of postholes. This clearly seems to indicate some sort of ceremonial or symbolic use for the mound, although it’s not clear what that would have been. Bostwick notes that some of the posts seem to align with the solstice and equinox sunrise positions as viewed from atop the mound, and he suggests that Mound 16 may have served as a “ritual sundial” of some sort. 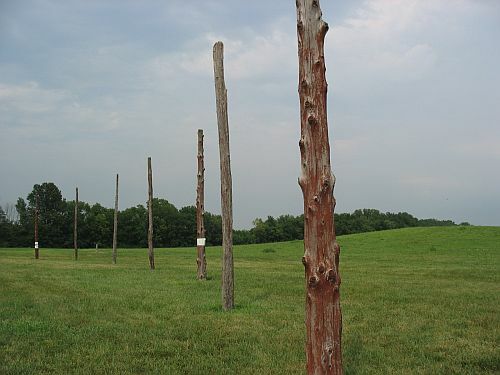 In this respect it is very reminiscent of the “Woodhenge” ring of posts next to Monk’s Mound at Cahokia, which has also been interpreted as an astronomical marker. Still, this interpretation is rather speculative at this point and Bostwick concludes his discussion of the mound with a call for further research on its possible astronomical alignments. The upshot of all this from my perspective is that the history of astronomical knowledge in the southern Southwest actually seems to be just as murky as that further north. In both cases the most apparent astronomical alignments in architecture seem to date quite late, although this doesn’t say much about the time depth of the knowledge behind them. There are a few intriguing hints in more general aspects of Hohokam society that may provide some insight, however. One is the adoption here of the Mesoamerican ballgame, played in distinctive courts that are primarily associated with the Sedentary period and the florescence of Snaketown (which has two). As Bostwick notes, in Mesoamerica the ballgame was often associated with astronomical symbolism and particularly with the sun and the calendar. Its introduction among the Hohokam around the beginning of the Sedentary period may therefore indicate the introduction of certain religious motifs or practices from the south that emphasized celestial, and especially solar, patterns. Bostwick also notes one admittedly speculative but very interesting theory regarding this introduction which associates it with a solar eclipse in AD 797 which would have been visible to the Hohokam, and which was followed a few years later by a series of disastrous floods. It’s possible that the Hohokam perceived the eclipse as an omen predicting the floods, and that they adopted new religious practices associated with the sky to prevent further disasters like this. Another eclipse in AD 1076 may have been associated with the abandonment of Snaketown and other major Sedentary period villages and the reorganization of Hohokam society into a new form during the Classic period. Notably, this change included the decline of the ballcourt system and the rise of new forms of ritual associated with platform mounds. A subsequent solar eclipse in AD 1379 was again followed a few years later by catastrophic floods that many scholars consider important factors in the ultimate collapse of Hohokam society. This eclipse theory is fascinating, although it’s obviously very speculative and probably impossible to prove or disprove conclusively. There was a lot of other stuff going on at the same time as each of these societal transformations, of course, and it’s likely there were multiple factors involved in each case. It’s still not clear what role Hohokam astronomical knowledge might have played in the development of similar knowledge at Chaco. The Chacoans may have noticed alignments in their local environment basically independently of anything similar going on further south, they might have heard rumors about Hohokam astronomy that spurred them to develop their own, or they might have had detailed knowledge of Hohokam practices that they used to implement similar practices themselves. The extent to which the Chacoans and Hohokam were aware of each other and the extent to which they interacted either directly or indirectly are important questions for understanding Southwestern prehistory, and they have not received very much attention from scholars who specialize in either society (although some of Steve Lekson’s recent work has been an important exception). The murky history of astronomical knowledge in both areas doesn’t seem to shed much light on these questions at this point, but with further research it may become more illuminating. Happy solstice.